South America is a continent. It is located entirely in the Western Hemisphere and mostly in the Southern Hemisphere. 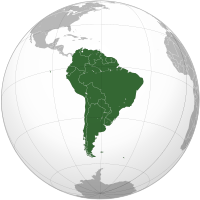 South America has thirteen countries and three territories, including two island territories. It is bound by the Caribbean Sea and North America to the north, the Atlantic Ocean to the east, and the Pacific Ocean to the west. The Andes Mountains run close to the west coast, and the center and northeast is dominated by the basin of the Amazon River and the Amazon Rainforest. South of that is the Brazilian Highlands and the prairies of Patagonia, and south of that, the highest Andes Mountains and the frigid Tierra del Sur. Portuguese is the official language of Brazil. Spanish is the official language of most of the other countries, except Guyana and Suriname. English is spoken in Guyana, and Dutch is spoken in Suriname. Also, French is spoken in French Guiana (a territory of France) and English is spoken in the Falkland Islands and South Georgia and South Sandwich Islands (territories of the United Kingdom). Native languages, such as Quechua, Aymara, and Guaraní, are also spoken in some of the western and central countries. This page was last edited on 2 May 2017, at 00:25.